A North Lanarkshire Primary School has been voted ‘top of the pops’ by Scotland’s leading anti-sectarian charity. Pupils from Primary 7 at Holy Family PS, Mossend have been working with Nil By Mouth over the last eight months on a range of activities aimed at raising awareness of sectarianism. The charity was so impressed with the levels of enthusiasm and commitment shown by the pupils that they secured funding to allow them to record and produce an album of songs celebrating diversity in Scotland. 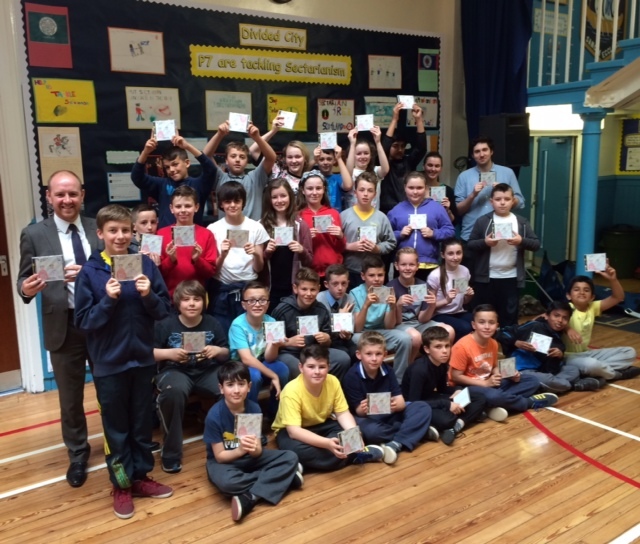 The first copies of the CD, entitled ‘Children of the Future’ , were handed over to the pupils by Nil By Mouth and local Mossend Cllr Frank McNally at a special ceremony at the school. Earlier this year Holy Family teamed up with Mossend Primary to perform the play ‘Divided City’ focusing on how friendships can overcome sectarian division. “I am absolutely delighted at the great work undertaken by Holy Family’s Primary 7 class, not only in producing their fantastic ‘Children of the Future’ album, but for all they have done this year to raise awareness of the scourge of sectarianism.